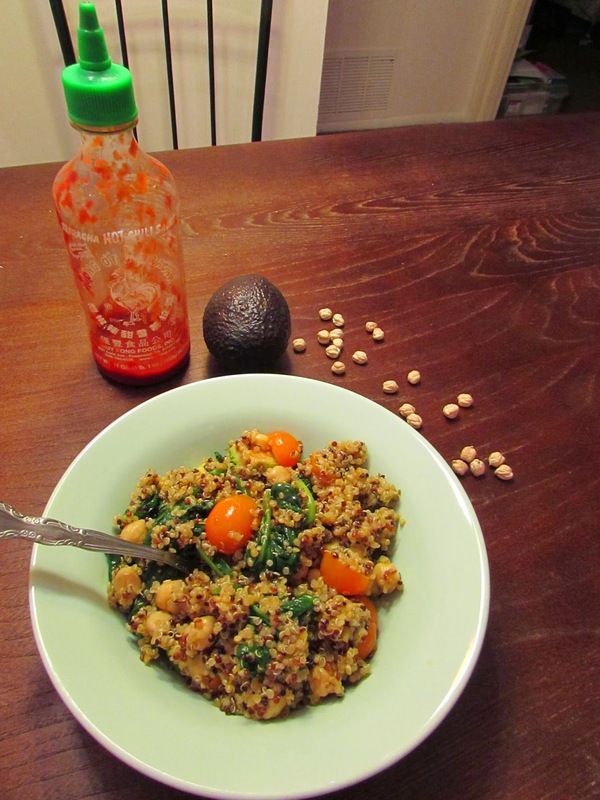 I have been enjoying this hearty grain salad for dinner this past week- each day putting a new twist on it. 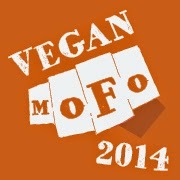 I wasn’t even originally planning on posting it for Vegan Mofo, but it’s so simple and hearty that I just couldn’t resist. 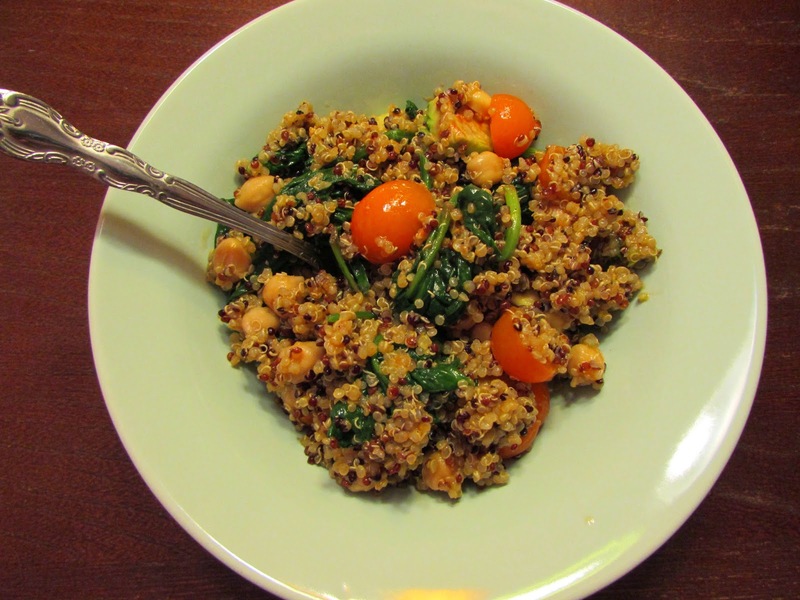 The base is a bed of fluffy quinoa and savory, toothsome chickpeas. For this bowl, I mixed in my veggies of choice: steamed spinach and the sweetest yellow cherry tomatoes I’ve ever had (courtesy of Whole Foods). They burst with tangy sugar when you pop one in your mouth. Mmmm, I’m salivating just thinking about them. Anyway, then I stirred in my fat of choice, chunks of avocado, and sprinkled on some sea salt, pepper, and doused everything with sriracha. When I gobbled these bowls down at home this past week, I doused them in garlic powder and nutritional yeast, which makes everything taste like cheezy garlic bread. Mmmm… However, if you are going among the public, you may want to skip these fragrant adornments. But if you are going to be laying around the house all night, garlic nooch it up. You won’t be sorry. 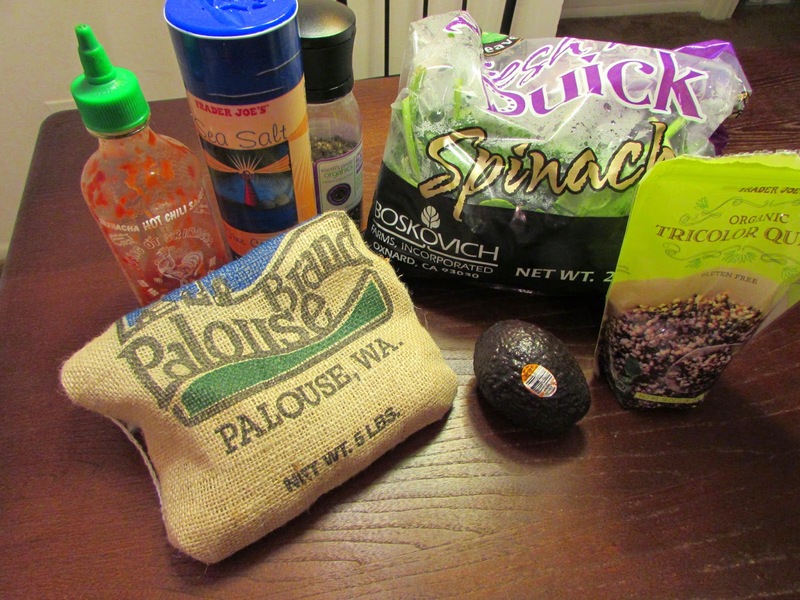 Feel free to add in any other toppings you like, such as garlic powder, nutritional yeast, or herbs. Devour. 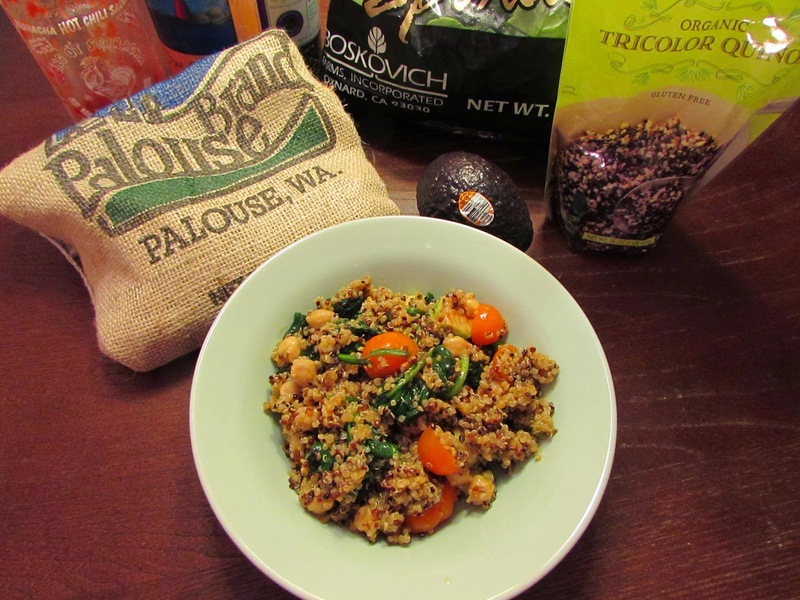 Note: I use wonderful Palouse Brand dried chickpeas that I cook up in large batches often. You can buy them on Amazon. They even tell you the exact farm they come from- purdy cool in my book. Also, if you are planning on eating this for a few meals, cook up a cup of quinoa and crack open a can or two of chickpeas and feast for days. Wow this looks delicious! Thank you for posting!